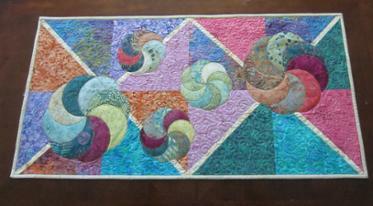 Gene Black an Alabama Artist and Quilter: What? Am I Crazy? I am working on/learning, rehearsing a musical. I am making quilted notebooks for the Holiday Faire. I have "who knows how many" UFOs in my pile. We are watching to see how Hurricane Irma is going to impact us, as the projected path keeps changing. So, of course, I needed to start a new project - right? Okay, yes, I am clearly a bit crazy. I used one of the patterns that I won and started a table topper. I got part of it done and said "Hmmmm...what if?" And we all know how dangerous a question that can be! I took the outer "circle" and used it as a frame for another UFO. For now they are just placed together. Nothing has been joined. I am contemplating the idea of making this the center of a medallion quilt. But I am also thinking it could be a great wall quilt-once I figure out how I would hang it. The outer circle is somewhere in the vicinity of 24" in diameter. 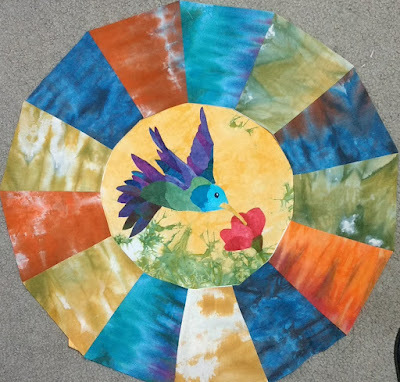 Instead of the hummingbird, I could possibly make the circle shape in the Free Space pattern and put it in the center. I need to figure out the finished diameter of those circles. Then I can decide if I want to make the large one or the smaller one to put there. But then, I may have another idea before I get around to finishing it. Only time will tell. I think I love that! lol....very typical of an over-achiever to start a new project and get carried away on the wave of creativity. Ideas and decisions abound. No boredom in your house!! Love what you have shown. Will be fun to see what you end up doing. I love the new project and also the way your mind takes you from one idea to another. I think all quilters have several "new" projects going at once with another idea stuck in their heads....hehehehehe!! Those colors are magnificent together. I like the hummingbird in the middle. It would be special in a medallion quilt.